I can't believe the snow is finally melting and the temperature is slowly rising! Daylight Savings is one of my all time favorite days of the year. I start looking forward to it in February. St. Patrick's Day is only 3 days away and spring is only 6 days away!! This makes me super happy!! Since I'm still on maternity leave, I can't show you what is happening in my classroom. So, about three weeks ago, I went to our local library to checkout a book for St. Patrick's Day. I wanted to share some ideas with you and offer a holiday freebie. Well, as my new life goes, I'm FINALLY getting around to writing a post and giving you something to use in your classroom. At least I'm getting it out BEFORE St. Patrick's Day...that's a feat in itself. When I went to the library, St. Patrick's Day books were slim pickens. The librarian found two books by Eve Bunting (awesome:) and a few other random authors. 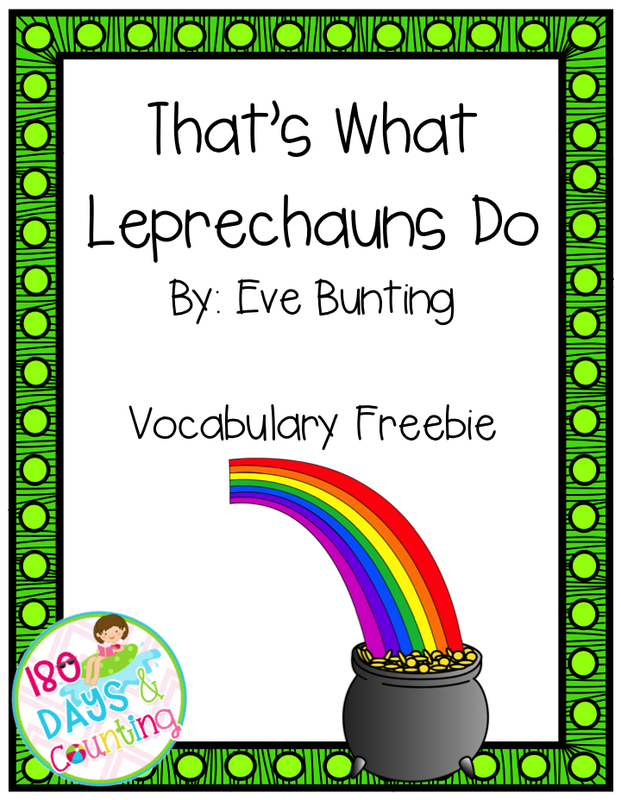 I decided to go with That's What Leprechauns Do, by Eve Bunting. Have you ever read this book? I've never heard of it, but will definitely use it with my class next year! It's about three leprechauns who have one job to do...put the pot of gold under the rainbow. 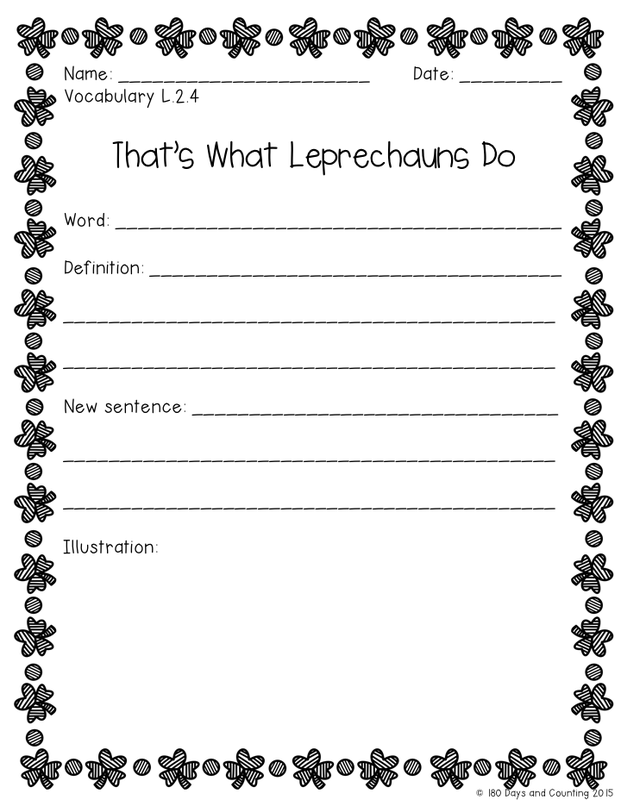 Along the way, they get into mischief...because, that's what leprechauns do! You'll have to read the book to find out if they accomplish their one and only duty. 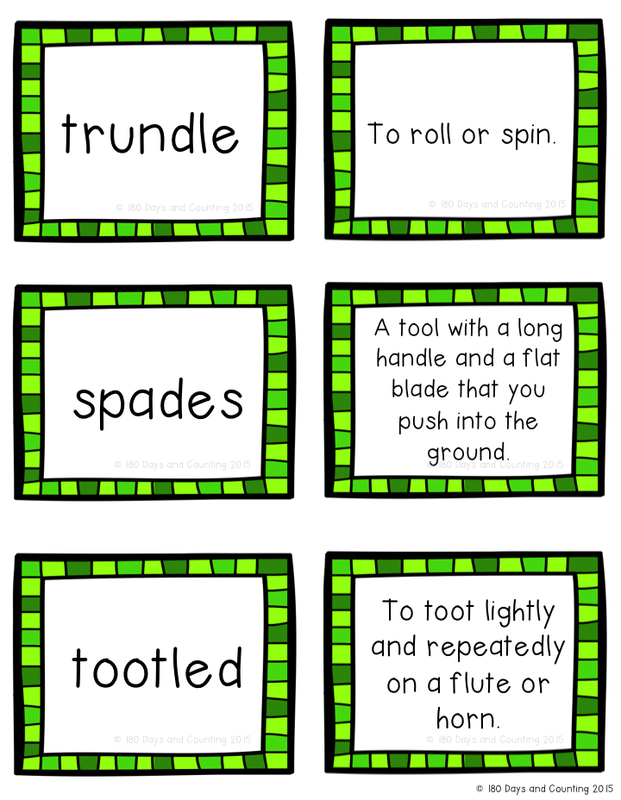 As I was reading the book, I found a few vocabulary words that students might find difficult. I'm not sure about your district but one of the newest "pushes" in our County is vocabulary. 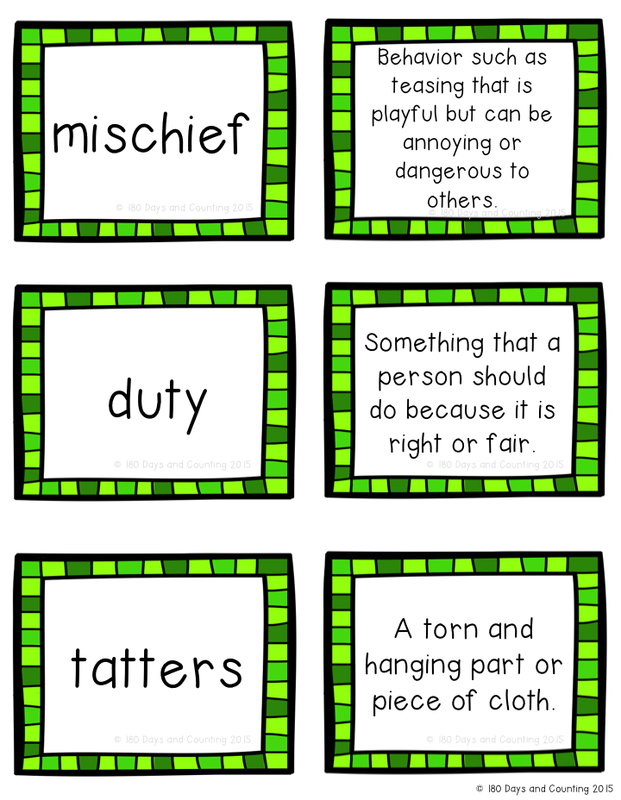 After I preview a book to read to the class, I will often make vocabulary cards. I have the tricky words as a set and then the definition for each word. Before reading, I like to show them the word cards and put them up on the chalkboard. My students LOVE when they hear me read one of the words...all too often, this causes a great flurry of hands in the air and some calling out..."Ooooh, Mrs. Coleman, there's that word!!" Once we finish the book, we go back in, find the words, and match the definition to each one. We use context clues, picture clues, or a dictionary to help us. We have several classroom dictionaries; which come in handy when students are working in partners or small groups. But, when I need to write the definition before the lesson, I love the site WordSmyth. Have you ever used this site? The reason I like it so much is because it gives three levels of definitions...beginner, intermediate, and advanced. I find this extremely helpful when I need to simplify the meaning of a word. Make sure to check it out! After you do, come back and let me know what you think. After we find the words in the book and discuss their meaning, students need to choose one word and complete a follow up assignment. They write their word, write the definition, use it in a new sentence, and illustrate it. If you would like this activity, click on any of the pictures below. Thanks for reading my rambles! Stay tuned for another activity to go along with this book.